Many of you have heard me say that MEMS-enabling Quality of Life (QoL) products are “improving mankind” in ways that we never thought possible (see my blog for Medical Electronics Design). As seen in the recent announcement for the Qualcomm Tricorder XPRIZE (yes that Tricorder, the one from Star Trek!) – the future of medical diagnosis, treatment and rehab is MEMS. I KNOW the winner of the Qualcomm Tricorder XPRIZE will have lots of MEMS inside. To see where MEMS can be found inside today’s QoL products, I am pleased to present Katie Matlack’s blog iOS Medical Peripherals: Convenient and Connected. Clearly, MEMS is and will continue to improve QoL. Thanks to their familiar interface, Web connectivity, and powerful processing capabilities, with the right app and plug-in these iOS devices can work as super smart medical devices that make sharing as easy as the push of a touchscreen button. Consumers can now access increasingly high-quality medical devices, making it easy to be more actively engaged in their own health. And home and rural care givers can benefit from the portability and versatility of iPad and iPhone based devices. Below I’ll discuss five examples of powerful iOS medical devices I’ve found that already exist. French company Withings developed this blood pressure monitor that features an app and a cuff that fits most average-sized people. Accurate data on your blood pressure can help you monitor hypertension, which can lead to serious consequences for your heart, brain and kidney. The Withings monitor can even work with an iPod Touch, and runs at $129. You can use the device to share your data with your doctor. This device isn’t yet available to the masses, but given its utility I imagine it will be soon. It features a small clip that attaches to your fingertip. The clip beams a light through your fingertip to a receiver on the opposite side; the amount of light received is used to determine how much oxygen is saturated in your blood. Developed by the Electrical and Computer Engineering in Medicine research group together with the Pediatric Anesthesia Research Team at the University of British Columbia, it was originally created to help make anesthesia care safer in the developing world, but can also be useful to patients with heart of lung problems such as emphysema. From Sanofi-Aventis comes this glucose meter app and plug-in. The glucose meter is a well-known device to anyone with diabetes. Today, diabetics test blood sugar with needles and a clunky kit; the iBGStar offers a small add-on to the iPhone that’s said to give better, more accurate results. Plus, getting your data on your iPhone means you can share it easily, and you can get reminders on your iPhone when it’s time for another check. This device has a simple setup: just snap a plastic case onto the back of your iPhone and you’re ready to go. The case has two electrodes in the back that, when you press the phone against bare skin of your thumbs or–for a better reading–your chest, can measure and track your pulse. It was built by Alivecor and Oregon Scientific. It’s not perfect, since it admittedly gathers a limited amount of data on your heartbeat, meaning it can’t quite compete against a real ECG. But for e-patients looking to get a good look at their heartbeat or caregivers looking for a quick diagnostic, it might just do the trick. OK, with a price tag of around $7,500, it’s still not quite a device for the masses. But this ultrasound peripheral and program still runs lots cheaper than traditional machines, and does serve as a step in the road to democratizing access to patient information. Though the device, from Mobisante, doesn’t run on iOS yet, I predict it will soon, since one major obstacle–the lack of a USB port in an iPad or an iPhone–will be eliminated in the latest upgrade to the iPad coming out soon. Wi-Fi and cell connectivity mean images can be shared quickly from the device, meaning caregivers might be able to more easily, frequently, or quickly share data with patients about their joey in the pouch. Katie Matlack is the Medical Software Analyst at Software Advice, a free online resource that provides home health software reviews and evaluates other software products. Sensors are proliferating in our cars. According to IHS, the MEMS sensor market continues to grow strong in automotive applications with compound annual growth revenue (CAGR) of 10% within the 2010-2015 timeframe. With the emergence of electrification, the 12V battery (also known as a low voltage battery) is more and more solicited by the electronic equipment of the car and has to handle all modes of operation (drive, start, stop, and standby). The risk of shortage becomes real with unavoidable leakage current when the car is not in use. To mitigate the battery consumption when the car is stopped and the engine is switched-off, all ECUs (electronic control unit) connected to the battery are limited on a maximum stand-by current in order to not discharge the battery in a short time. 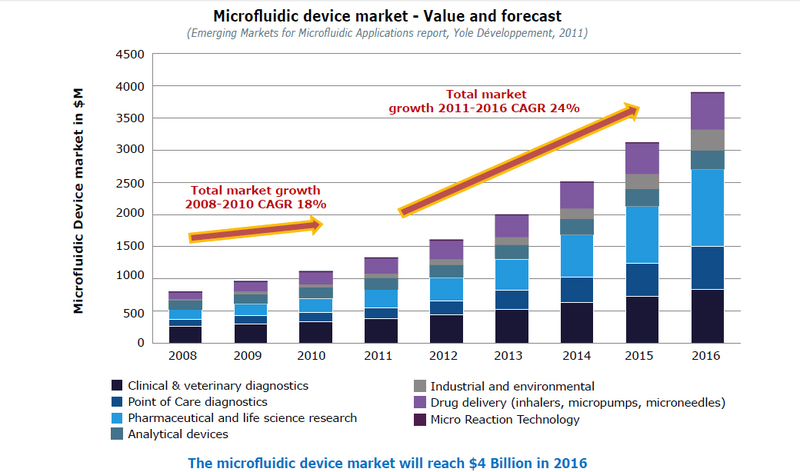 Heavy recent investment by big players and significant new technologies now poised for introduction are accelerating the growth of the microfluidics market, pushing it towards $4 billion by 2016. We estimate sales of microfluidic devices were up a healthy 19% in 2011, reaching roughly $1.3 billion, outpacing the 18% growth the sector saw from 2008 to 2010. We expect growth to pick up further over the next few years, with sales of fab-level microfluidics devices (not including chemistry) to average 23% annual compound growth through 2016, pushing the sector to almost $4 billion. Some major manufacturers from other large volume polymer industrial markets are looking at turning their injection molding production skills to the microfluidics market. The small microfluidics volumes to date have made it diffi cult to get full industrial- volume controlled- process quality production –and such efficiencies are needed to spread the mold costs for injection molding over sufficient units to bring costs for disposable polymer microfluidics cartridges down to the necessary levels of $1-$2. But new players like Sony with its video disk experience and Konica with its microlens production skills will bring more sophisticated polymer volume manufacturing technology to the microfluidics sector. New lower cost technologies for more useful point-of-care diagnostics are also about to hit the market. Growth in that potentially large market has been slower than expected, as suppliers have struggled to find compelling enough applications at low enough costs. But several elegant solutions for low cost tests for conditions where fast response really matters are poised for commercial introduction. We look for major players like Philips, BioCartis and Samsung to introduce new platforms for low cost polymer microfluidic diagnostic tests for cardiac states, bacterial infections and blood gases this year and next. Samsung Electronics will likely soon get international approvals for the bench- top automated blood analyzer it’s now selling to small clinics and hospitals in Korea. The system tests for 19 clinical analytes, including cholesterol, glucose, and indicators of heart, liver and kidney disease, all in about 12 minutes, thanks to a clever cassette design. The approach uses different spinning profiles of centrifugal force to move and mix the fluids for different steps, and laser heating to melt seals on various preloaded reagent wells as needed. Royal Philips Electronics and bioMérieux have integrated bioMérieux’s assay technology for heart attack markers on to Philips’ rapid diagnostics testing platform and are now engineering a commercial disposable cartridge and setting up manufacturing for product launch in 2013, aiming to match lab test accuracy with faster speed and lower cost. Some of the technology acquisitions are also starting to show the results from the wider reach of their new big-company parents. BD Diagnostics aims to make the automated bench-top molecular test station technology it acquired with startup HandyLab into the laboratory equivalent of the smart phone, partnering with other infectious disease assay suppliers to port more tests to the platform. Beyond the current screening tests for MRSA infections and C.difficile diarrhea in hospital patients and B streptococcus in pregnant women, it’s working with Diagenode in Belgium to develop molecular diagnostic assays for respiratory and gastrointestional infections and meningitis, Biodiversity in Italy to port its molecular diagnostics for infections in immunocompromised and transplant patients, and Lab21 in the United Kingdom to add its Aspergillus fungus test to the automated test platform. Similarly,testing giant bioMérieux is porting assays for immunocompromised patients from its acquisition Argene to the automated test cartridges its developing with its part-owned partner Biocartis. MEMS is opening up a whole new world of possibility for transportation—and European companies such as Audi and BMW are leading the charge. After a dip in production during the recent recession, the automotive industry is now leaner and meaner—and manufacturers are poised to differentiate themselves through new safety, energy-efficiency and performance features. As part of its first MEMS Executive Congress in Europe, MEMS Industry Group (MIG) will join automotive suppliers, MEMS manufacturers, and a top market analyst in a panel discussion on the role of MEMS in the changing automobile. What can we expect from tomorrow’s automotive safety systems and what role is MEMS likely to play? How is MEMS enabling more energy-efficient cars? While recent growth in automotive has been fueled by demand from BRIC (Brazil, Russia, India, China) countries, automotive manufacturers in these countries are not yet utilizing MEMS to the same degree as their European, Asian and North American counterparts. How will this affect the overall worldwide adoption of MEMS for automotive safety, energy-efficiency and performance? Please join us March 20, 2012, 11:15 a.m.-12:00 p.m., for the panel, MEMS and the Changing Automobile. Bernhard Schmid, manager, Sensor System & Technology Center Chassis & Safety Division, Continental Teves AG & Co. oHG. ACUTRONIC, AEPI, A.M. Fitzgerald & Associates,Asia Pacific Microsystems, Bosch, Bosch Sensortec, CEA Léti, CSEM, Freescale Semiconductor, Fries Research & Technology (FRT), GSA, IHS iSuppli, imec, iNEMI, IVAM, Maxim, MST BW: Mikrosystemtechnik Baden-Württemberg, NMI, Okmetic, Smart Systems Integration, Solid State Technology, SVTC and Yole Développement. Register before February 20, 2012 to save 10%! Sensor fusion—the intelligent combination of data from several sensors for the purpose of improving application or system performance—has the MEMS industry abuzz with promise. With potentially attractive benefits that include the ability to meet or exceed power, performance, and cost requirements in heterogeneous embedded systems—including mobile handsets and tablets—sensor fusion is moving rapidly into the commercialization phase. We polled several MEMS Industry Group (MIG) member companies about their respective approaches to sensor fusion, presenting an industry snapshot of solutions. For Jay Esfandyari, MEMS product marketing manager, STMicroelectronics, “sensor fusion uses a set of digital filtering algorithms to compensate for the disadvantages of individual sensors to output accurate dynamic information, such as might be used in a location-based sensor.” And while “sensor fusion” has won its place in the technical lexicon, “multi-sensor data fusion” more accurately describes this functionality. MEMS in sports is not a new idea. Years ago, Freescale began demonstrating how MEMS could help analyze and improve golf swings by retrofitting accelerometers in the shaft of a golf club. Check out this 2007 video clip from Freescale. Since then, I’ve seen an increasing number of examples of MEMS in sports; not just in demos, but in actual products. Like many things in high tech, good design has spurred the adoption and application of MEMS in sports. While hosting the first MEMS TechZone at CES last month, I saw another compelling example of MEMS-enabled sports from the guys at Diesel Dogs, as they were our booth-buddies and part of Freescale’s exhibit. Diesel Dogs has partnered with Freescale to develop Bluetooth Smart Weights, MEMS-enabled barbells that relay the movements of weights to an Android application. Diesel Dogs’s Smart Weights could be used for people who want to optimize their weight training workout. This is the kind of MEMS in sports that can help me become a smarter athlete. Thanks to the lower price point of MEMS devices (including accelerometers, gyroscopes, and microphones), we are seeing an increase in the adoption and integration of MEMS in sports. This is such a hot topic that MEMS Industry Group (MIG) — a partner of Sensors in Design (part of Design West Summit) — will showcase MEMS in sports at next month’s conference. MEMS Industry Group (MIG) is bringing MEMS Executive Congress , our highly successful executive conference and networking event, to Europe! With European innovators leading the revolution in smart systems for industrial automation—and a global audience in critical need of managing the world’s increasing energy-related challenges—MIG has assembled a panel of business leaders using MEMS to build more intelligent and power-efficient buildings. How is MEMS enabling smart buildings—and even smart cities? How are leading companies using MEMS to reduce emissions and energy consumption? How about monitoring and reporting energy usage? What are the latest advancements in energy harvesting?